One foot in the grave after an 0-2 start in the month of December. In Dallas, the Cowboys had lost two straight and it was beginning to take the look of a something we've seen before. 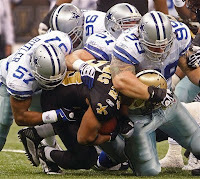 A division lead squandered and with the Giants hot on their playoff heels, the sky was falling fast on the '09 Cowboys. However, in less than 24-hours, the Cowboys are not just alive they're well. Tony Romo is quietly putting together a Pro Bowl caliber season, and he's reason no. 1 why the Cowboys are inching closer to the postseason. Since October 25th, Romo has thrown just three interceptions in 313 pass attempts. Anyone disagree? Romo is holding onto the ball and not allowing himself to be forced into making poor decisions, something that has plagued the Cowboy gunslinger. The difference this year isn't that Romo is just staying mistake free, he's going out and winning games. In last nights victory over previously undefeated New Orleans, Romo went for 300+ yards for the third time in four games and for the tenth straight game, he threw a touchdown pass. The National Football League is a quarterbacks league, without a play making quarterback you have zero shot. Tony Romo is aware and has willed this team to their biggest December win in well over a decade. 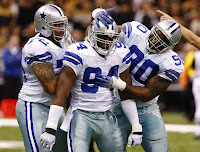 The once punchline of jokes, Romo is quickly turning things around in Big D.
You've got to gameplan for DeMarcus Ware. Cowboy Nation tipped their 3D lenses to the bridge of their noses and waited in silence as DeMarcus Ware was carted off the field, neck stabilized just a week ago. Two plays later the Chargers put (7) seven on the board , season over right? Wrong. The star Cowboy linebacker not only played, he flat out dominated forcing two fumbles and recording two sacks. DeMarcus Ware is easily one of the top five most talented defensive forces in the NFL, and the New Orleans Saints found that out the hard way. While Dallas' secondary clearly struggles at times, the opposing offenses still must get the ball out early for fear of #94 on their blindside. If big games are meant for big players, then the Cowboys are in luck with their final two very important division games in Washington and at home against Philadelphia, their biggest player is playing larger than life. On Saturday night, Ware recorded multiple sacks, the fourth time he's done that this season. With the Cowboys beginning to show the same heart as their leaders, things are looking up. A team that once lacked toughness and heart, seems to be showing it. After losing two in a row amidst rumours of another December slide, this team didn't just lie down for the Saints to continue their run. With that win, the Cowboys made a statement: (1) They are very capable of putting together a good gameplan, a gameplan fit to stop high powered offenses. (2) It's possible Jason Garrett knows what to do after Saturday night. Attempting passes 34 times and rushing the ball 40, I'd say that is a pretty good mix. Both Barber and Jones got enough touches which gave the Cowboys 140+ yards on the ground. (3) This team is tired of the pressure, they've begun to grow a chip on their shoulder which was more than evident. From Romo discussing the comments of Tony Dungy saying they "had no chance" to receiver Roy Williams asking fans to not crown New Orleans just yet around mid-week, these guys are getting tired of it and beginning to show it. If Big D can continue this, they'll begin to fear in the mind of every opponent. Sure, It's just one game. However, like the Giants of two seasons ago maybe it just is that type of game to snap a team back to where they should be. The Cowboys have had the talent for years, it's possible they are just now putting it together.